Each September, the Coffs Garden Club conduct a garden competition for home owners, renters, commercial/industrial properties and schools. There are many different categories in this competition and there is bound to be one suitable for most folk. The competition is usually launched the last Saturday in July (28th) with closing date for entries the first Friday in September (7th). The gardens are judged about 10 days later (to allow for administrative work). This judging is conducted over three days with various areas done on each day. There will be a lot of extra information about this competition in the coming weeks but for now you can read more about the competition with some hints on how to help you prepare and display your garden in the Spring Garden Competition. Before anything else read the schedule (available from 28th July) for full details of categories, conditions of entry, judging days, open garden days and of course, the date of the Presentation Night where you can receive your awards and prizes! It is important to remember that the judge will be looking only at what they see in your garden at the time of their visit, not what might be there next month or even next week and certainly not what looked good last week. So try to ensure that your garden is at its absolute best on judging day - this can be difficult with climatic conditions but just try to show off your garden to its best advantage on that day. One way this can be achieved is by planning your plantings well in advance and paying attention to detail. It is also very important to know that the judge has only limited time to look at each garden, so it helps if you make a good first impression and have that 'WOW' factor from the outset. So what can you do to help give your garden the best chance of success in the competition? 1. Overall garden appeal is really important. People should want to be in your garden, and that includes the judge. Resist the urge to put in an 'instant' or just planted garden. Ensure that any paving and pathways are clean and safe with no overhanging branches or weeds and are not hazardous. Beds should be well mulched with material that doesn't look as though it was put down the day before judging. Shrubs and hedges should be neatly clipped. Flowers should be dead-headed where appropriate, and any dead leaves removed from plants and shrubs. If something has failed in your garden, think of ways of filling the gap, ie turn what could be a negative into a positive. Try to have things like garbage bins and old, unkempt garden furniture away and out of sight. Preferably don't have washing on the line. Put away hoses and gardening equipment. And secure your pets, particularly dogs. Think about featuring a bench or table and chairs where you and others can sit and enjoy the garden. 2. The judge will also look at the condition of your garden. Plants should look healthy. There should be no disease or insect infestation to be seen, and your garden should not have any signs of nutrient imbalance, eg yellowing of leaves etc. Make sure you remove any dead plants, fallen branches, palm fronds or other debris. 3. The lawn (if you have one) should be healthy, weed free and nicely edged. Any other key features you have in your garden should look their best as well. 4. The veggie garden (if you have one) needs to be seen as a working garden, ie, it is quite acceptable to have resting beds, and succession plantings are always looked upon favourably. 5. 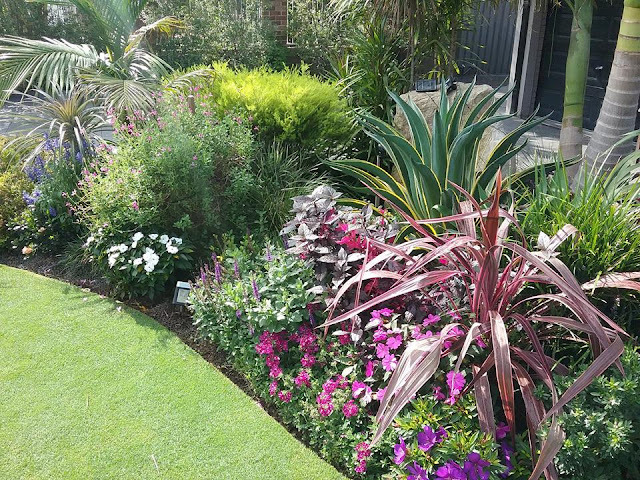 Garden design is another important aspect of judging and includes things such as layout, use of colour, line, form and texture, and of course, plant use. Try to have a clear theme for your garden and stick to it. Where possible, have garden 'rooms' that help make best use of your available space. Or simply have 'flow' to your garden - something that encourages the visitor to move on further in your garden. 6. Finally, please remember that judges are trained to objectively assess different kinds of gardens, so don't be afraid to enter. Over the years the competition has seen a myriad of styles in gardens and garden spaces. For instance, there have been gardens comprising predominately pots, all annual plantings with popping colour, all Australian natives, cactus, and gardens that have incorporated vegetable growing among flowers etc etc. 7. It is a condition of entry that your award winning garden is open to the public for viewing 10am - 4pm on Sat 22 and Sun 23 September. Please do not be intimidated with all this information. Gardeners who love to garden usually have gardens that fulfill all of the above without even trying! If you require further information about the competition please do not hesitate to contact either Pat 6690 2511 or Maria 6656 2429, they will be only too happy to assist. All on-line material will be available from 28 July 2018 at this site. Disclaimer: These hints have been prepared only to provide general information to competition entrants to help them prepare their gardens for competition and they answer many of the questions that entrants pose to the club. The Coffs Harbour Garden Club makes no guarantee that following any, or all of the above hints will result in success for any particular entrant in the competition. Each entrant remains responsible for preparing and display their garden as they see fit.